Parsnips are the perfect winter vegetable, hearty and comforting for winter stews but their sweetness makes them feel a bit festive too. Dive into Becca's satisfying soup which is great to banish any winter chills. It's strange – I'll go eleven months of the year without touching a parsnip, and then, as soon as December rolls around, I go mad for them. I think I always forget how much I love them. They're the perfect vegetable to eat at this time of year; hearty and comforting (perfect for winter stews), with a subtle sweetness and an earthy, root vegetable flavour. This time I put them to good use in a classic parsnip and apple soup. I didn't want the soup to be overwhelmingly sweet so I added a potato too – and that was about it. Such perfect flavour pairings don't need much else. No fancy herbs or spices, just good, simple flavours. This really is easy to make, and the end result is a perfectly balanced, smooth soup. 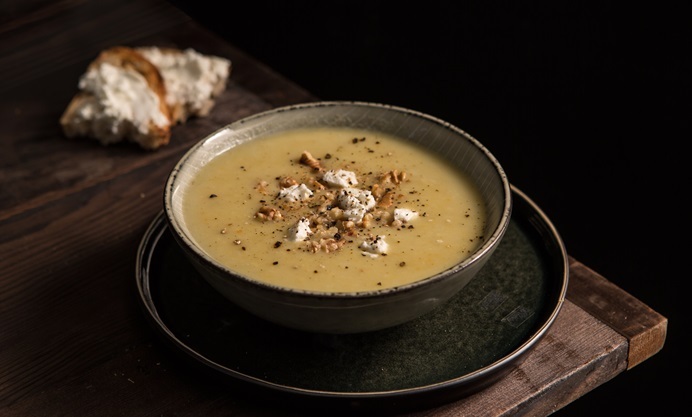 The starchy potato helps to make the soup creamy without needing to add any extra dairy – I'm certainly not opposed to having a tub of double cream in my fridge at this time of year, but that doesn't mean I'm not grateful for a lighter meal once in a while! I like to serve my soups with some toppings to add a bit of variety. This time I used a few crumbles of soft goat's cheese and some chopped walnuts for a bit of crunch, as well as plenty of black pepper. The goat's cheese, especially, went perfectly with this slightly sweet soup. However, if you prefer, you can choose your own toppings, or just serve this soup on its own or with some fresh bread and butter. 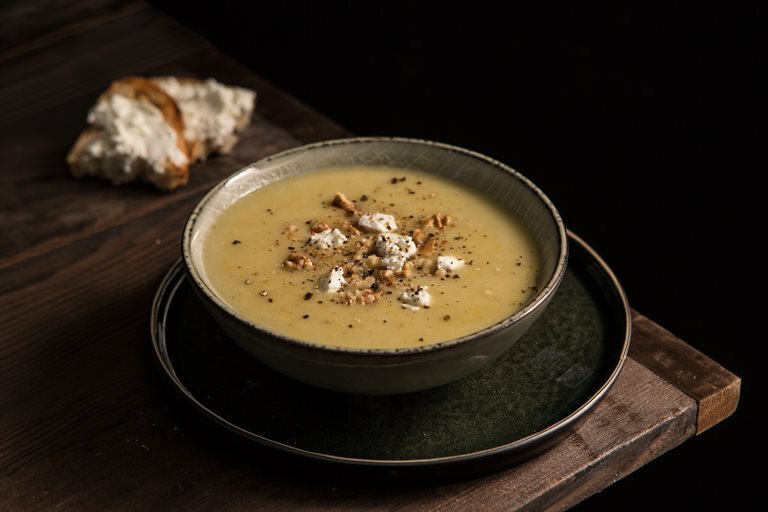 There's nothing better than coming in from the cold outside, putting on your slippers and settling down for a hot dinner – and apple and parsnip soup is the perfect option. If you're organised, you could even make it the night before so that when you get home, it will be just minutes before you're ready to dig into to a big bowl of steaming soup. Liverpool-based Becca is the writer of the food blog Amuse Your Bouche, and specialises in simple vegetarian recipes that anyone can create, regardless of their cooking ability.